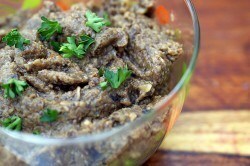 Our Mushroom Pate is such a versatile recipe! You can snack on it, spread it on toast or a veggie burger, fill mushroom caps and top them with Parmesan(broil them until the cheese is golden and crispy) or mix it with 1/2 cup of Goat Cheese for a richer spread. Drizzling it with some fancy Truffle oil before serving it will definitely wow your guests too so don’t miss the opportunity if you have it available! Heat olive oil and 2 tablespoons butter over medium-high heat. Add onions and shallots, if using and cook for 7 to 8 minutes, until they brown at the edges. Raise heat to high and add fresh mushrooms, thyme, salt and pepper. Cook, sautéing, until mushrooms brown further and release their liquid. Cook until all of the liquid has evaporated, then add Madeira, Marsala, sherry or wine and do the same. Add rehydrated mushrooms and their soaking liquid, and cook this almost completely off. No liquid should run into the center if you drag your spoon through the mushrooms, clearing a path. Adjust seasonings to taste — seasoning is everything here — then stir in last tablespoon of butter. Serve with toasted baguette or crackers, chopped flat-leaf parsley, and/or chives, and additional caramelized onions. Previous Post Easy Mango Sorbet Ice Cream Next Post Chef Jeff was the best!